When trying to identify an unknown material, FTIR (Fourier Transform Infrared Spectroscopy) analysis is a great tool to answer, "What is it?". It works well for solids, liquids and gases, and can be applied to pure substances or mixtures. Quantitative or qualitative analysis is available. FTIR is not the best technique to measure trace contaminants, but functions extremely well identifying bulk materials. Are you trying to determine material composition, identify impurities, or track changes in your raw materials or finished product? FTIR can provide quality control for your manufacturing process. FTIR analysis also has regulatory compliance applications, such as Respirable silica (NIOSH 7602), for industrial hygiene at construction and petroleum fracking sites. Fourier Transform Infrared Spectroscopy (or FTIR for short) identifies chemical bonds in materials via their infrared absorption spectrum. Transmission and Attenuated Total Reflectance (ATR) modes permit analysis of a wide range of solids, powders, non-aqueous liquids and gases. The FTIR spectrum is the "infrared fingerprint" of the material. Qualitatively, unknowns can be identified by comparison with an extensive library of FTIR spectra. Our reference sample database includes tens of thousands of spectra for comparison purposes. Quantitatively, FTIR-ATR Analysis is often the first step in the materials analysis process due to its speed and simplicity. 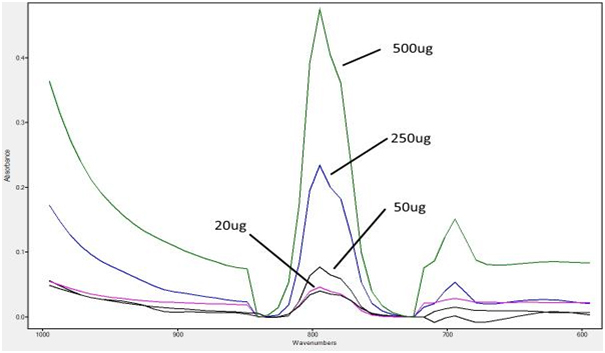 Samples weighing as little as 50 milligrams can be evaluated using FTIR-ATR analysis. The small sample size allows for selective identification of particles, residues, films or fibers. Qualitative scans can be used to rapidly assess unknown materials for identification and for rapid checks on impurities. In terms of process QC, high quality spectral scan of your reference material(s) can be generated and stored in our spectral library database and quickly compared to new materials in your manufacturing process and flag them as acceptable or unacceptable. A wide variety of materials can be quantified using the FTIR-ATR materials characterization technique. 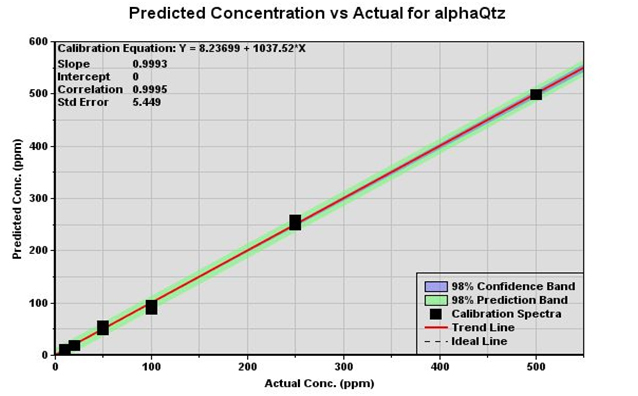 Quantification requires that a standard calibration curve of known concentrations be created. This is how FTIR is used for the analysis of respirable silica using the NIOSH 7602 method or for determining low levels of Biodiesl in diesel fuel.